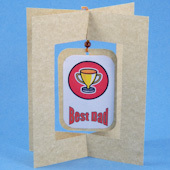 Go beyond the ordinary with this novelty card featuring a dangler that twists and turns. 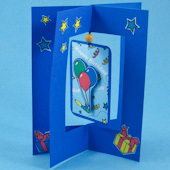 See how easy it is to make this freestanding greeting card with a 3-dimensional opening for hanging your special dangler. 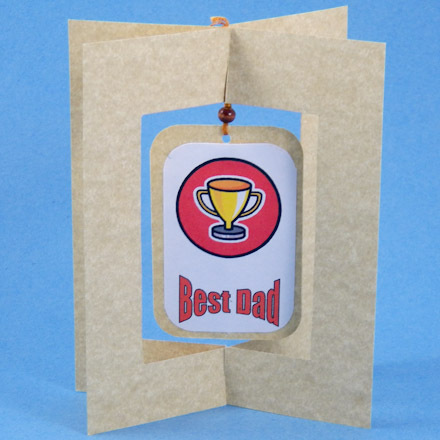 Make a card for your Dad with printable Father's Day Danglers. In this tutorial, you will learn how to make a rectangular opening for a rectangle-shaped dangler. Once you have master this technique you will be able to design dangler cards with different shape danglers and openings. 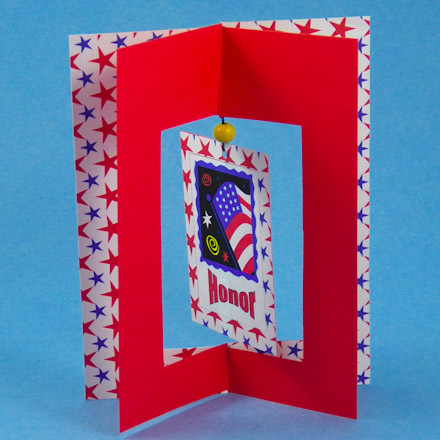 The card in this tutorial uses red, white and blue and is suitable for any U.S. patriotic holiday—Memorial Day, Flag Day or the Fourth of July. 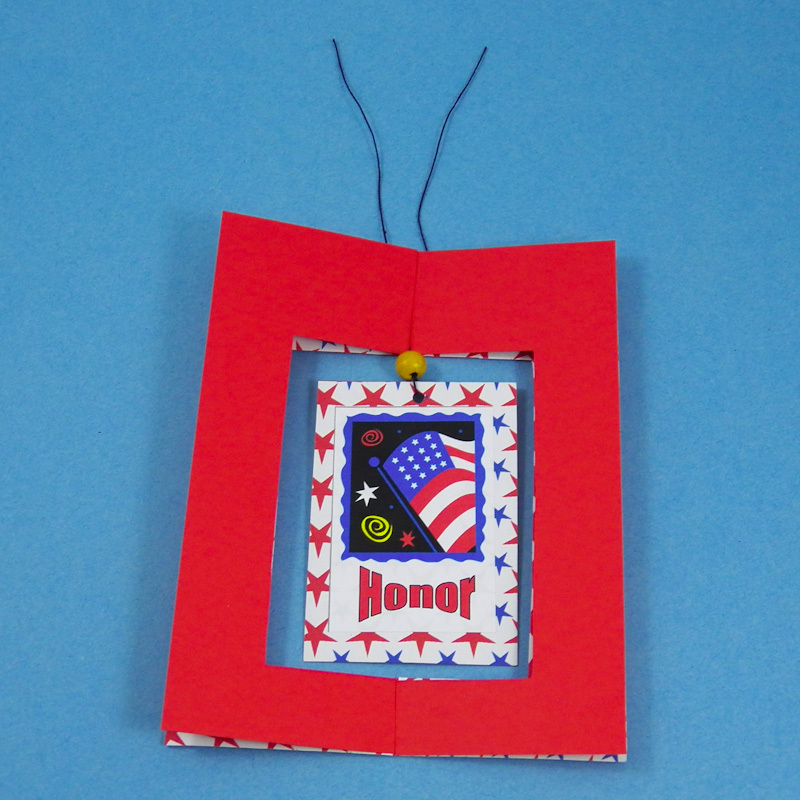 The project also includes printable danglers for Memorial Day and the 4th of July. Related craft: Make a freestanding Halloween card that also doubles as a decoration—see how in Halloween Dangler Cards. Choose a theme and colors for your card. 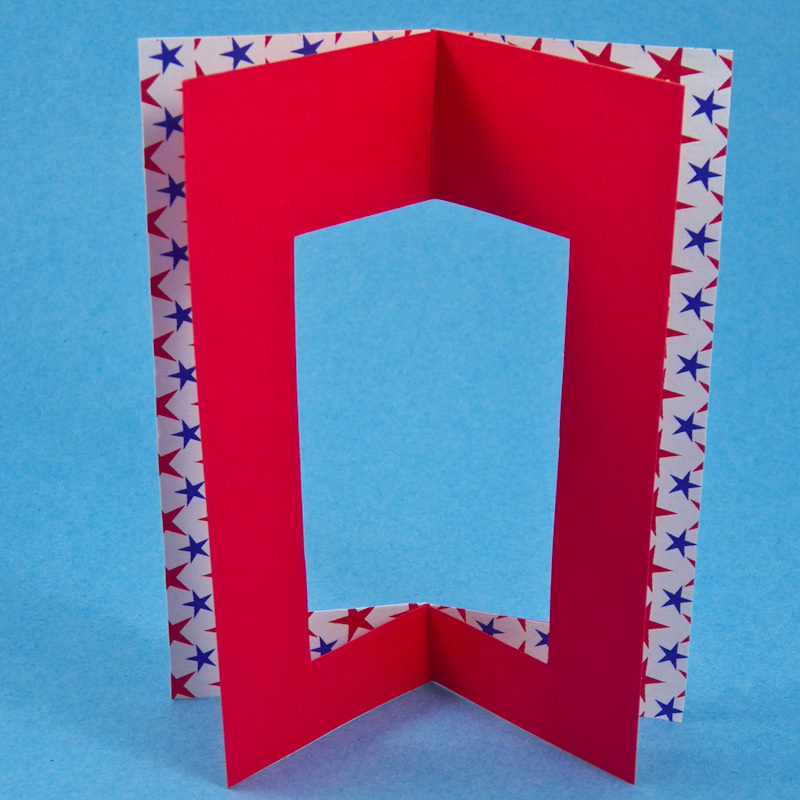 The card in this tutorial uses red, white and blue and features a patriotic theme. You will need decorative papers or stickers to go with your theme. 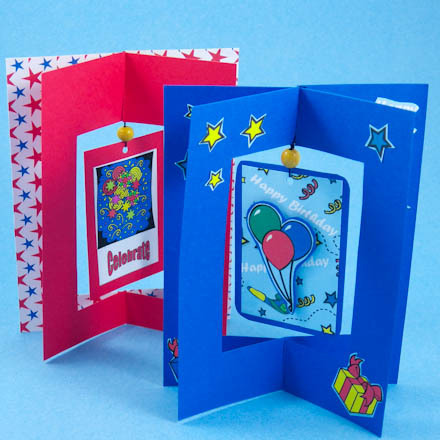 The sample card uses Aunt Annie's Red and Blue Stars ePaper and free clip art images from the Web. 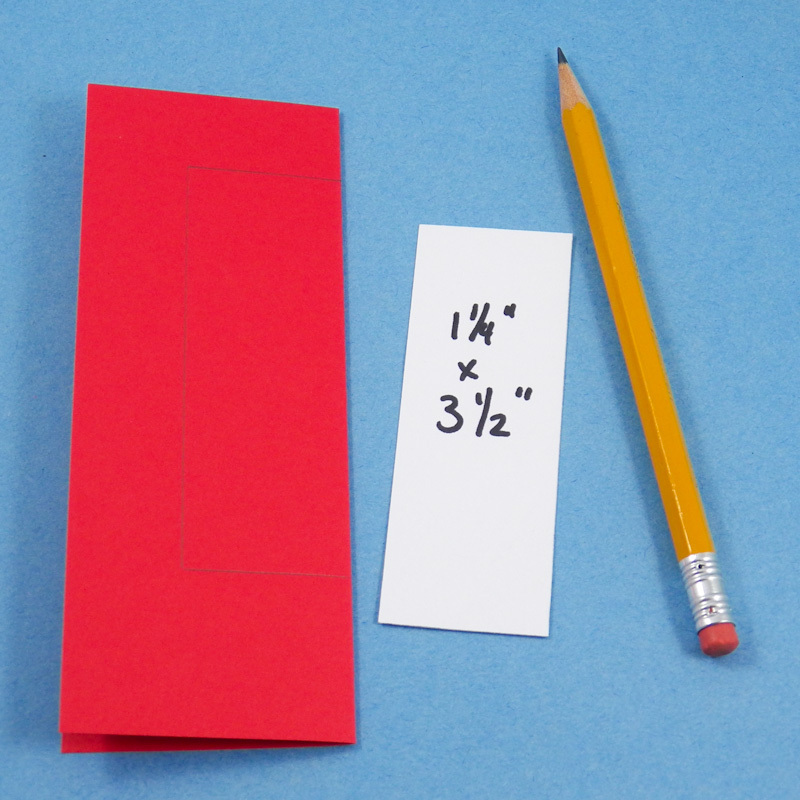 Cut your card blank in half to create two 4¼″ by 5½″ rectangles. 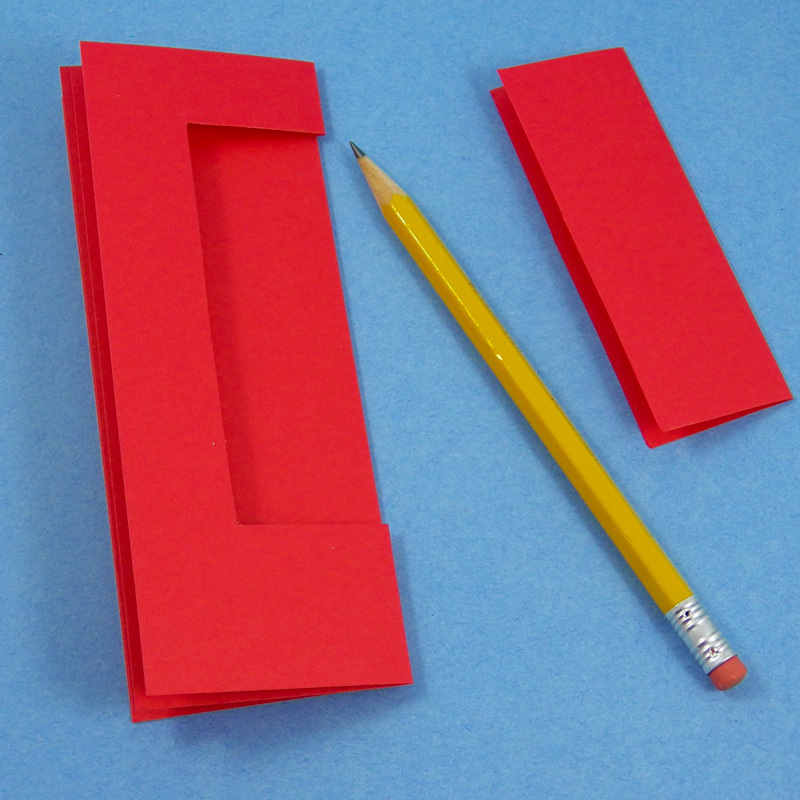 Fold both card pieces in half, lengthwise. Cut a card opening template that is 1¼" by 3½" from the scrap of cardstock. Place the template along the center fold of one card piece and trace around it. Cut out the opening. Lay the cut card piece on top of the second card piece and use its cut opening as a template for the second card piece—trace and cut. This ensures that the openings on the two card pieces are aligned with each other. Erase any visible pencil lines. 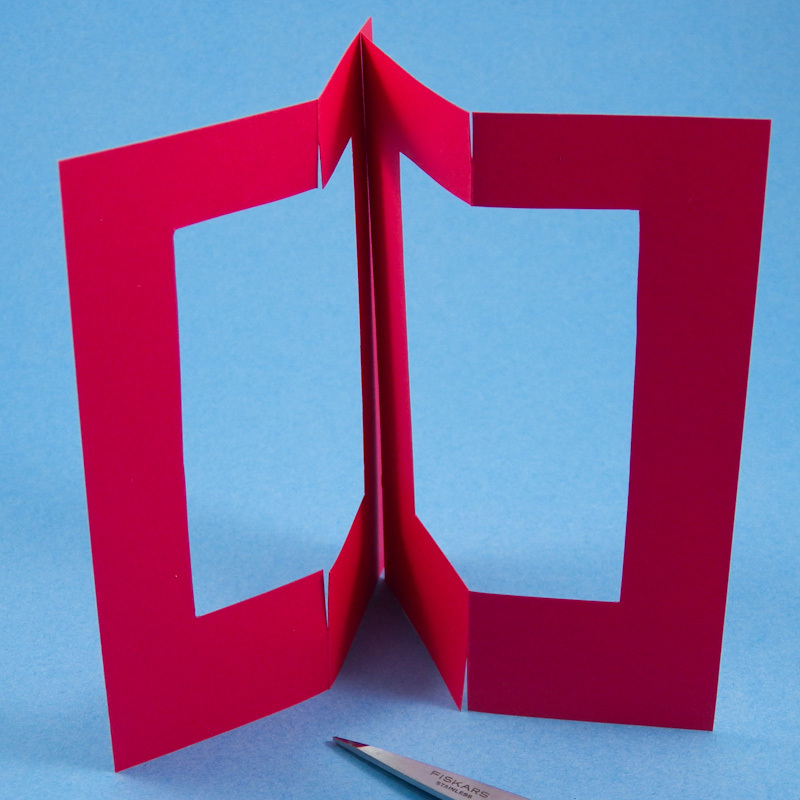 One one card piece, cut a slit on the center fold from the bottom that extends halfway to the opening. Cut another slit from the top that goes halfway to the opening. On the second card piece, repeat but make the cuts from the inside of the opening—one towards the top and the other towards the bottom of the card. Join the two card pieces by sliding the top and bottom slits together. Slightly bend the card piece with the cuts from the outside through the opening of the second card piece, slipping the bottom two slits together. Flex the card piece and slip the top two slits together. The card should stand on it's own when the card pieces are spread. 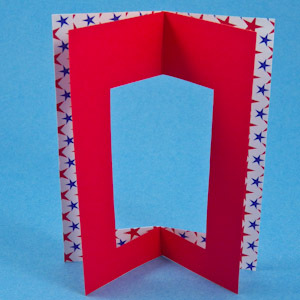 Tip: The decorative paper used in the sample is Aunt Annie's Red and Blue Stars ePaper. Cut a 2" by 3" rectangle from cardstock as the base for your dangler. The cardstock cut away to make the card opening can be trimmed down to make the dangler. Decorate both sides of the dangler with pictures and/or a message. Tip: In Microsoft Word or a graphics program, fill a rectangle a little smaller than the 2" by 3" dangler with images and/or words. Print it, cut to size and glue to the dangler. These danglers use Word Art in Microsoft Word and clip art images downloaded from a website. Cut a 10" length of string or thread for hanging the dangler. Punch a hole in the top center of the dangler and push the string through the punched hole. Bring the two ends of the string together and thread through the hole in the bead. Tie a double knot close to the top of the bead. Slip the two ends of the string between the front and back pieces of the card on either side of the join. Tie the ends together in a secure knot at the top of the card. Hide the tails between the card's front and back. Trim the loose ends, if needed. Spread the card pieces and stand the card up. That's it! What other dangler ideas do you have? 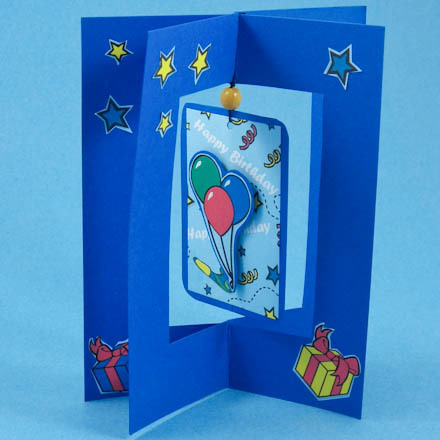 Tip: It's easy to make a birthday dangler card, or a card for any occasion, by decorating the card and dangler to match the card's theme. This card was made using cut outs from Aunt Annie's Happy Birthday Balloons and Gifts ePaper. This printable pattern includes images and messages for Father's Day that are sized for the 2" by 3" rectangular dangler. 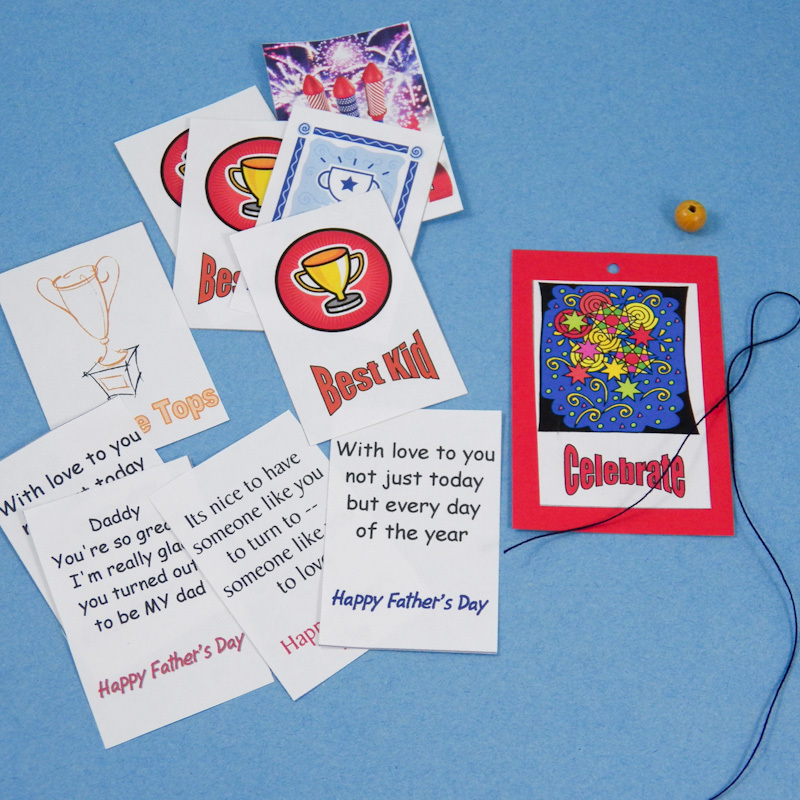 Just print, cut and glue—more details at Father's Day Dangler Cards. 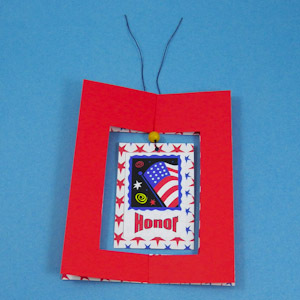 This printable pattern includes images and messages for Memorial Day and Independence Day, July 4th, that are sized for the 2" by 3" rectangular dangler. Just print, cut and glue. Example Father's Day dangler card using a dangler design from Aunt Annie's Father's Day Dangler pattern, more at Father's Day Dangler Cards. Tip: Make different shape openings and danglers to match your card's theme. 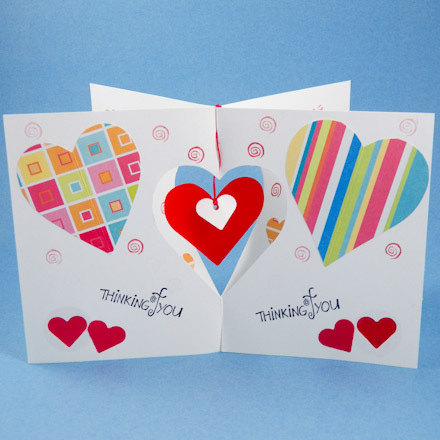 This card was made by joining two full-size card blanks and cutting a heart shape opening.